F. Murray Abraham (born Murray Abraham; October 24, 1939) is an American actor. He became widely known during the 1980s after winning the Academy Award for Best Actor for his role as Antonio Salieri in Amadeus (1984). He has appeared in many roles, both leading and supporting, in films such as All the President's Men (1976), Scarface (1983), The Name of the Rose (1986), Last Action Hero (1993), Star Trek: Insurrection (1998), Finding Forrester (2000), Inside Llewyn Davis (2013) and The Grand Budapest Hotel (2014). He is also known for his television and theatre work and is now a regular cast member on the award-winning television series Homeland. Abraham was born as Murray Abraham on October 24, 1939 in Pittsburgh, Pennsylvania, the son of Fahrid "Fred" Abraham, an auto mechanic, and his wife Josephine (née Stello), a housewife. His father was Assyrian and emigrated from Syria at age 5 during the 1920s famine; his paternal grandfather was a chanter in the Syriac Orthodox Church. His mother, one of 14 children, was Italian American, and the daughter of an immigrant who worked in the coal mines of Western Pennsylvania. He had two brothers, Robert and Jack, who were killed in separate car accidents. Abraham was raised in El Paso, Texas, near the Mexican border. He attended Vilas Grammar School, and graduated from El Paso High School in 1958. He was a gang member during his teenage years. He attended Texas Western College (later named University of Texas at El Paso), where he was given the best actor award by Alpha Psi Omega for his portrayal of the Indian Nocona in Comanche Eagle during the 1959–60 season. He attended the University of Texas at Austin, then studied acting under Uta Hagen in New York City. He began his acting career on the stage, debuting in a Los Angeles production of Ray Bradbury's The Wonderful Ice Cream Suit. Abraham added "F." to his stage name in honor of his father, Fahrid. He has stated "Murray Abraham just doesn't seem to say anything. It just is another name, so I thought I'd frame it". Abraham made his screen debut as an usher in the George C. Scott comedy They Might Be Giants (1971). By the mid-1970s, Murray had steady employment as an actor, doing commercials and voice-overs. Abraham can be seen as one of the undercover police officers along with Al Pacino in Sidney Lumet's Serpico (1973), and in television roles including the bad guy in one third-season episode of Kojak. He played a cabdriver in the theatrical version of The Prisoner of Second Avenue (1975), a mechanic in the theatrical version of The Sunshine Boys (1975), and a police officer in the film All the President's Men (1976). Despite these small roles, Abraham continued to do commercials and voice-over work for income. But in 1978, he decided to give them up. Frustrated with the lack of substantial roles, Abraham said, "No one was taking my acting seriously. I figured if I didn't do it, then I'd have no right to the dreams I've always had." His wife, Kate Hannan, went to work as an assistant and Abraham became a "house husband". He described, "I cooked and cleaned and took care of the kids. It was very rough on my macho idea of life. But it was the best thing that ever happened to me." Abraham appeared as drug dealer Omar Suárez alongside Pacino again in the gangster film Scarface (1983). He gained visibility voicing a talking bunch of grapes in a series of television commercials for Fruit of the Loom underwear. After Amadeus, he next appeared in The Name of the Rose (1986), in which he played Bernardo Gui, nemesis to Sean Connery's William of Baskerville. In its DVD commentary, his director on the film, Jean-Jacques Annaud, described Abraham as an "egomaniac" on the set, who considered himself more important than Sean Connery, since Connery did not have an Oscar. That said, the film was a critical success. Abraham had tired of appearing as heavies and wanted to return to his background in comedy, as he explained to People Weekly Magazine in an interview he gave at the time of its release. Though Abraham had fewer prominent roles in the next decade or so, he became known for his roles in Woody Allen's Mighty Aphrodite (1995), Ahdar Ru'afo in Star Trek: Insurrection (1998), and Gus Van Sant's Finding Forrester (2000), where he once again played nemesis to Connery. He had a significant role in The Bonfire of the Vanities (1990), but chose not to be credited due to a contract dispute. Abraham's relatively low-profile film career subsequent to his Academy Award has been widely considered an example of the "Oscar jinx". According to film critic Leonard Maltin, professional failure following an early success is referred to in Hollywood circles as the "F. Murray Abraham syndrome". Abraham rejected this notion and told Maltin, "The Oscar is the single most important event of my career. I have dined with kings, shared equal billing with my idols, lectured at Harvard and Columbia. If this is a jinx, I'll take two." In the same interview, Abraham said, "Even though I won the Oscar, I can still take the subway in New York, and nobody recognizes me. Some actors might find that disconcerting, but I find it refreshing." A 2009 guest appearance on Saving Grace began a new phase of Abraham's career, wherein he has become gradually more prolific onscreen. Further guest appearances include roles on Law & Order: Criminal Intent and Louie, among others, as well as a recurring role on The Good Wife between 2011 and 2014. Additionally, Abraham was the primary narrator for the PBS series Nature between 2007 and 2010, narrating 32 episodes (plus one more in 2013). Abraham's most notable television role came about through Showtime's drama series Homeland, in which he portrayed black ops specialist Dar Adal. This role resulted in his first Emmy Award nomination in 2015. He featured prominently in two widely acclaimed recent films: first as folk music impresario Bud Grossman in the Coen brothers' drama Inside Llewyn Davis (2013), then as the mysterious Mr. Moustafa in Wes Anderson's The Grand Budapest Hotel (2014). Since Amadeus, he has mainly focused on classical theatre, and has starred in many Shakespearean productions such as Othello and Richard III. He was highlighted in many other plays by the likes of Samuel Beckett and Gilbert and Sullivan, and played the lead in Anton Chekhov's Uncle Vanya (for which he received an Obie Award). Abraham has focused on stage work throughout his career, giving notable performances as Pozzo in Mike Nichols's production of Waiting for Godot, Malvolio in Twelfth Night for the New York Shakespeare Festival, and Shylock in The Merchant of Venice for the Off-Broadway Theatre for a New Audience (TFANA) in March 2007, which was performed at the Duke Theatre in New York and also at the Swan Theatre, part of the Royal Shakespeare Company. He reprised this role in February 2011, when he replaced Al Pacino in the Public Theater's production. In the 1997/98 Broadway season, he starred in the new chamber musical Triumph of Love opposite Betty Buckley, based on Marivaux's classic comedy. The production did not find a large audience, running 85 performances, after its pre-opening preview period. He has also taught theater at Brooklyn College. In 2016, he played the title role in Classic Stage Company's production of Nathan the Wise. Abraham has been married to Kate Hannan since 1962; they have two children, Mick and Jamili, and one grandchild. In January 2010, Abraham was the on-the-scene hero of a real-life crime scene at the Classic Stage Company in New York City, when he scuffled with a thief in the dressing room area during a public rehearsal. Abraham has spoken about his faith: "I've attended many churches. I grew up as an Orthodox Christian and I was an altar boy. I love the Society of Friends, the Quakers. I attended their meetings for almost 15 years. I'm (2008) now attending the First Presbyterian Church of New York because they're such a generous, terrific church with outreach. They reach out to old people, to homeless, to A.A., to cross-dressers; it's truly a church of the teachings of Christ. Religion is essential to my life." 1994 Surviving the Game Wolfe Sr.
1976 All in the Family Clerk Episode: "The Unemployment Story: Part 1"
2009 Saving Grace Matthew Episode: "What Would You Do?" 2010 Law & Order: Criminal Intent Dr. Theodore Nichols Episode: "Three-In-One"
2010 Bored to Death Professor Richard Hawkes Episode: "I've Been Living Like a Demented God!" 2012 Blue Bloods Leon Goodwin Episode: "The Job"
2013 Do No Harm Cozar Episode: "Six Feet Deep"
2013 Elementary Daniel Gottlieb Episode: "A Landmark Story"
2016 Inside Amy Schumer Diplomat Episode: "Madame President"
In July 2004, during a ceremony in Rome, he was awarded the "Premio per gli Italiani nel Mondo". This is a prize distributed by the Marzio Tremaglia foundation and the Italian government to Italian emigrants and their descendants who have distinguished themselves abroad. In 2009, he was recognized by the Alumni Association of the City College of New York with John H. Finley Award in recognition of exemplary dedicated service to the City of New York. In 2010, Abraham was the recipient of The Gielgud Award (Theatre) for that year. In 2015, Abraham was an inductee to the American Theater Hall of Fame. He also has an honorary doctorate from Rider University in Lawrenceville, New Jersey. ↑ "Getting to Know F. Murray Abraham". La Stage Times. Retrieved 2013-11-14. 1 2 "Academy Award-Winning Actor F. Murray Abraham | The Diane Rehm Show from WAMU and NPR". The Diane Rehm Show. Retrieved 2013-11-14. 1 2 3 4 5 6 Salomon, Andrew (2007-02-15). "The Lion in Winter". Backstage.com. Archived from the original on 2007-03-04. Retrieved 2007-02-15. 1 2 Stark, John (March 18, 1985). "His Meanie Role in Amadeus Makes Nice Guy F. Murray Abraham the Man to Beat for the Oscar : People.com". People Magazine. Retrieved 20 September 2016. ↑ How I Got My Equity Card. Actorsequity.org. Retrieved on 2012-10-15. ↑ F. Murray Abraham, Oscar Winner, Seeks Tolerance Through Arts. America.gov (2006-09-20). Retrieved on 2012-10-15. ↑ Tales from the Morgue: Hometown stars – F. Murray Abraham. Elpasotimes.typepad.com (2008-07-10). Retrieved on 2012-10-15. ↑ Farber, Stephen (September 20, 1984). "The New York Times: Best Pictures". The New York Times. Retrieved 20 September 2016. ↑ His Meanie Role in Amadeus Makes Nice Guy F. Murray Abraham the Man to Beat For the Oscar. People.com. Retrieved 2014-08-01. ↑ F. Murray Abraham Biography – Yahoo! Movies. Movies.yahoo.com. Retrieved on 2012-10-15. ↑ Jean-Jacques Annaud, The Name of the Rose, DVD commentary, Warner Home Video, 2004. ↑ "The Name of the Rose (Der Name der Rose)". Rotten Tomatoes. Retrieved 2013-11-14. ↑ Is winning an Oscar a curse or a blessing? at the Wayback Machine (archived December 7, 2008) film.com (2007). ↑ The official source for Broadway Information. IBDB. Retrieved on 2012-10-15. ↑ González, María Cortés. "Josephine Abraham, 96, loved life, according to famous son F. Murray Abraham". ElPasoTimes.com. El Paso Times and MediaNews Group. Retrieved 15 June 2013. ↑ Healy, Patrick (January 26, 2010). "F. Murray Abraham: Action Hero". The New York Times. Retrieved May 2, 2010. ↑ Rizzo, Frank. (2011-05-18) F. Murray Abraham Receives Obie for Tresnjak Production of "Merchant". Blogs.courant.com. Retrieved on 2012-10-15. ↑ F. Murray Abraham Gielgud Award 2010. Vimeo.com (2011-01-17). Retrieved on 2012-10-15. ↑ "Theater Hall of Fame Ceremony, Honoring Susan Stroman, F. Murray Abraham, Philip J. Smith and More, Presented Tonight". www.playbill.com. May 4, 2015. Retrieved June 3, 2015. 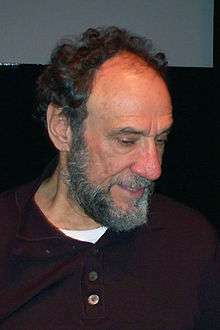 Wikimedia Commons has media related to F. Murray Abraham.